Add a splash of colour to your style with these sterling silver and diamond earrings from the Open Hearts Waves by Jane Seymour collection. 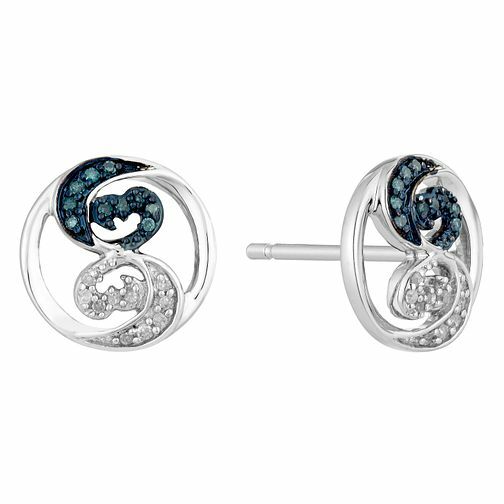 Featuring white and treated blue diamonds flowing into Jane Seymour's iconic Open Hearts design, meeting in the middle of a sterling silver circle stud earring. If your heart is open, love will always find its way in. Life is a wave; continuously building, cresting and releasing, always allowing for learning, connecting and revival. Open Hearts Waves Silver & Treated Blue Diamond Earrings is rated 5.0 out of 5 by 1.